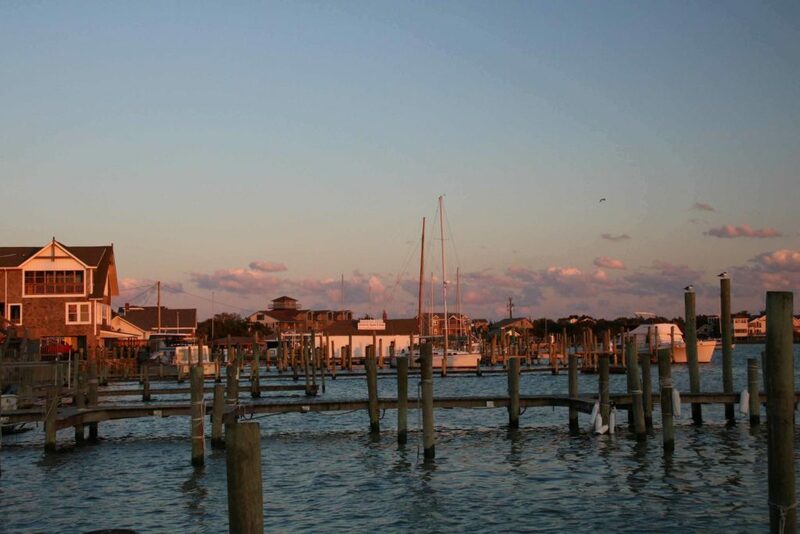 Ocracoke’s Silver Lake Harbor is bathed in golden light as the sun slides into the Pamlico Sound and the last commercial fishing boats return for the day. Bill Evans guides his vessel to the dock of the small fish house at harbor’s edge, returning from nearly 14 hours on the Atlantic Ocean with fishing partner Logan Jenkins. The two are tired but pleased with the day’s catch. Today it’s mostly Spanish mackerel even though this is also the season for bluefish, speckled trout, southern flounder, sea mullet, sheepshead, black drum and red drum. What the fishermen are allowed to fish for depends on a slew of restrictions and regulations and whether their boats are in the ocean on one side of the island or in the Pamlico Sound on the other. As tourists head to local restaurants to enjoy meals of fresh, wild-caught seafood from nearby waters, the small fish house is a flurry of activity. Three boats, including Evans’s and Shannon Dunn O’Neal’s (Shannon, pictured above, is one of the few fisherwomen on the island), arrive within a few minutes of the other, each with hundreds of pounds of fish to offload. Most boats fishing off the Carolina coast are considered small with a solitary fisher or a small crew of 2 or 3 people. Basket after basket brimming with Spanish mackerel are dumped onto a conveyor belt that carries the fish from the outside dock to the inside packing room. The conveyor dumps the fish onto a long, narrow table where they are sorted by size. They are then weighed and packed into boxes of ice to move onto a refrigerated truck that will transport them to the Wanchese Fish Company, a couple of islands away. From there, they are shipped to restaurants up the eastern seaboard to New York. Some are held back to be cleaned for the retail store, Ocracoke Seafood Company, at the front of the fish house. Others will go to the local restaurants that cater to the important island tourist industry. The fishermen have contracts with local restaurants and Jenkins sets to work cleaning and fileting a portion of his and Evans’s catch for four different establishments. “Local seafood is important,” Jenkins says. “You get imported seafood you don’t know what it is and you don’t know what is in it. 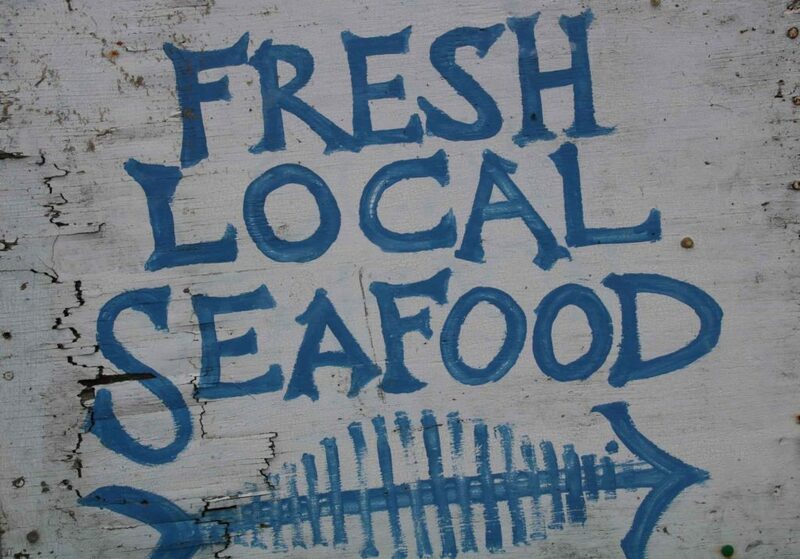 I like the idea of providing fresh, local seafood. I’m all about that. An island with a rich history. Ocracoke is a treasure of an island that sits at the southern tip of the barrier islands known as the Outer Banks of North Carolina. Accessible only by small private plane, private boat or a 2 ½-hour ferry ride from the mainland or an hour ride from Hatteras Island to the north, Ocracoke is 16 miles long and a half mile to 3 miles wide. It is steeped in maritime history. Edward Teach, also known as the infamous pirate Blackbeard, plied these waters in the early 1700s and German U-boats prowled the coast during World War II. Ocracoke Island Lighthouse, the oldest in operation along the Carolina Coast and the second oldest in the country, stands sentinel over the village with its beacon reaching miles into both the Pamlico Sound and the Atlantic Ocean. Ocracoke’s nearly 15 miles of pristine beaches are part of the Cape Hatteras National Seashore, preventing development and helping land top rankings in travel magazines. Wild ponies that are said to be descendants of shipwrecked Spanish mustangs roam a fenced portion of the island. Listed on the National Register of Historic Places, the small village, also known as Ocracoke, sits at one end of the island and lends a yesteryear charm. Wood-framed cottages (some made of wood salvaged from shipwrecks), white picket fences and people peddling bicycles down the tree-lined streets add to the appeal of this quaint fishing village with less than 1,000 year-round residents. So does the residents’ thick brogue that some call Elizabethan English. Less than 100 miles to the north, the first English-speaking colony was established on Roanoke Island in 1585. The dialect, sometimes referred to as High Tider or “Hoi Toider,” is often attributed to the island’s isolation. Sunset casts a warm evening glow on Silver Lake Harbor. 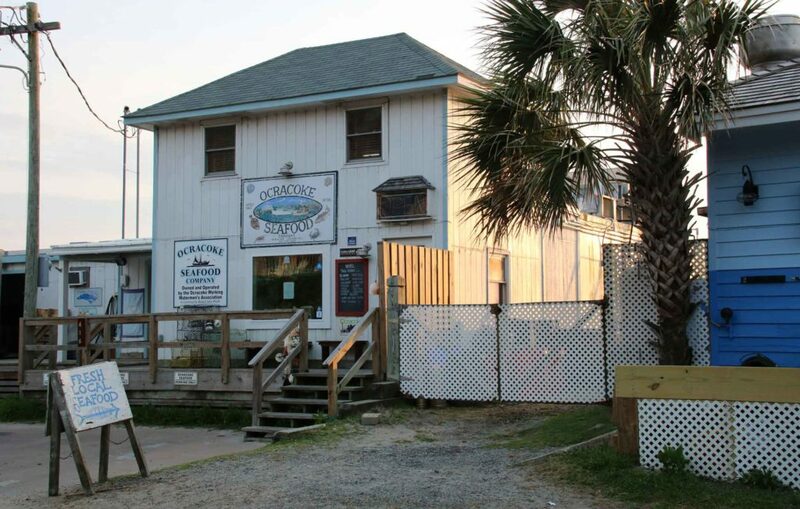 Even the small fish house plays a part in Ocracoke’s cultural heritage. It’s also crucial to this spit of land’s future as a fishing village. While the resilient residents have weathered numerous hurricanes, storms and trials inherent in island living, it’s a threat of a different nature that puts the island’s fishing heritage and livelihood in jeopardy. Saving the last fish house. When the last fish house on the island was shuttered and placed on the market about 10 years ago, the island’s small commercial fishing industry faced extinction. Without a fish house, fishermen had no place to pack their boats with ice early in the mornings before heading out to the nearby waters and no place to offload their catch at the end of the day. To haul it to the next island wasn’t feasible when it came to time and fuel costs. No one fisherman could afford the purchase price of the fish house, so the only option was to pull together to keep the fish house open. There was a lot to lose. “If we lost the fishing industry, we would lose more than our access to good, local food. We’d lose a way of life that gives purpose and flavor to a community,” says Robin Payton Payne, former executive director of the nonprofit Ocracoke Foundation. While the remote nature of the island contributes to the fierce independence that seems to be a trait of islanders, it also amplifies the necessity to help out a neighbor, says Rudy Austin, who made his living operating the Hatteras-Ocracoke ferry and now runs tours to the nearby island of Portsmouth. “Ocracoke is unique,” he says. ”When I grew up, everybody helped each other. Self-supporting neighbors helped neighbors. That is how we survived in the 1950s and 1960s.” And, no doubt, that was the case generations before, long before the ferries began making daily trips in the 1970s to and from the island. It was in this spirit that the entire community came together to save its last fish house, says Payton Payne. They viewed it as survival for both commercial fishing and the tourism industry, which is essential to the island’s economy. “You can’t call yourself a fishing village if you don’t have a fish house,” explains Austin. While the island sponsored fish fries, oyster roasts, bake sales and all sorts of fundraisers, funds from North Carolina’s tobacco buyout program – from the master settlement with cigarette manufacturers – turned out to be a major source of help, along with other partners. Under the umbrella of the nonprofit Ocracoke Foundation, 35 part-time and full-time fishermen and women formed the Ocracoke Working Watermen’s Association (OWWA) and then established the Ocracoke Seafood Company as a for-profit subsidiary that has both a wholesale and retail side. After expenses are covered, profits go to watermen based on individual annual catch. The Ocracoke Fish House. “You can’t call yourself a fishing village if you don’t have a fish house,” says tour operator Rudy Austin. Threats to the local fishing industry. Despite the accolades, they have a major fight on their hands to keep that heritage alive. “Fishermen are aging out,” explains Plyler. Like farming, the average age of fishers is 56. There are a handful of young fishermen and women in their early 20s though Plyler and others are concerned about the odds they face. Even so, “it’s a hard way to make a living,” says Vince O’Neal, who bought the Pony Island Restaurant in 1992 to supplement his fishing income. Most people on the island cobble together 2 or more jobs to make ends meet. Like most of the other fishers on the island, O’Neal grew up here and fished with his Dad, uncles and grandfathers. “At least 7, maybe 8 generations,” he says, of his family’s fishing tradition. The Ocracoke Working Watermen’s Association has an exhibit located in the former Will Willis Store & Fish House that dates back to the 1930s and sits at the edge of Silver Lake Harbor. It chronicles the island’s fishing heritage. A bumper sticker on display sums up the importance of keeping the local commercial fishing industry alive: Friends don’t let friends eat imported seafood.